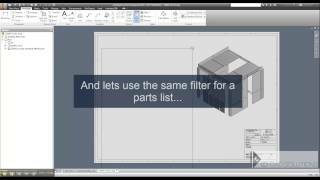 Would you like to filter components intelligently in assemblies, drawing views and parts lists? Are you currently maintaining view representations manually? If so, the View Rep Hero is for you. The View Rep Hero removes the common burden of maintaining view representations, associated drawing views and parts lists when the model changes. An unlimited number of saved filters can be created by iProperties, or by the Bill of Materials (BOM). These can be updated with a single click, and used downstream in drawing views and parts lists. The automatically generated View Representations can be locked, automatically fit-to-view, include virtual components, and many other options for flexibility. it is a great app and also great service from this company!